Catherine Goetze’s The Distinction of Peace is an important book. It breaks new ground in viewing peacebuilding as a field, and analyzing what attracts people to it and what enables some of them to remain. It contributes to research agendas on interventions in conflict zones, power in international encounters, and peacebuilding as a form of practice. 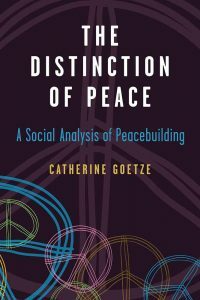 What Goetze does particularly well is to show how seemingly commonsensical arguments about the desirability of peace and non-violence are used to create and sustain boundaries of a field, whose tentative insiders draw on the authority embedded in these arguments to position themselves in pursuit of distinction.